Laurent believes strongly in giving back, and enjoys the opportunity to donate his cooking for philanthropic causes. Laurent has cooked for Nelson Mandela in a South African yearly event to help HIV-stricken families and is a long time supporter of Meals on Wheels and Project Open Hand in San Francisco. Though he regularly contributes to many local charities and fundraising events, of particular note is his own creation, “Taste and Tribute,” a bi-annual benefit convening 18 renowned chefs for the Berkeley-based Tibetan Aid Project. 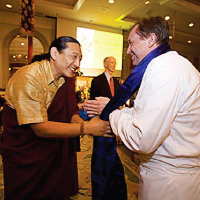 In support of Tibetan Aid Project’s efforts to preserve Tibetan culture, the 14th annual Taste & Tribute San Francisco benefit gala for the Tibetan Aid Project was held at the ballroom of the Four Seasons Hotel, San Francisco, on November 21, 2014. I am proud to be the inspiration for the first Taste & Tribute San Francisco held every year since 2001. Laurent is also strongly involved in NY every year in the dinner project with Tibet Fund and Tibet House with the Holiness The Dalai Lama. 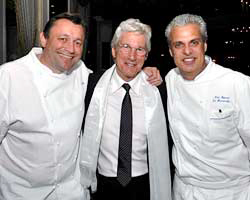 The gallery of our 2011 Taste & Tribute Dinner, courtesy of photographer Eduardo Solér.